Jewish Home senior ministers reportedly set to resign from government Monday morning after Netanyahu refuses demand for Defense Ministry. The Jewish Home party’s two senior ministers are expected to resign their positions in the government Monday morning, after Prime Minister Binyamin Netanyahu refused their demand that Jewish Home chief Naftali Bennett be appointed as Defense Minister, following the resignation of former Defense Minister Avigdor Liberman. On Sunday night, Netanyahu announced that he would serve as Defense Minister, replacing Avigdor Liberman, who resigned last week over the decision to accept an Egyptian-brokered ceasefire with the Hamas terror organization. Both Liberman and the Jewish Home had protested the ceasefire agreement. 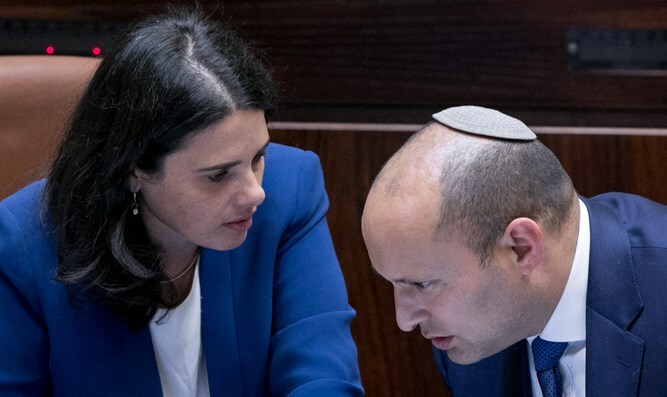 Following Liberman’s resignation, the Jewish Home issued an ultimatum to Netanyahu, demanding that Bennett be tapped to replace Liberman, or the party would bolt the coalition and force early elections. Netanyahu’s 66-seat majority in the 120-member Knesset was reduced to a bare majority of 61 with Liberman’s departure. Without the Jewish Home’s 8 seats, the coalition would be reduced to just 53 seats, short of the majority required. Both Bennett, who currently holds the Education Ministry portfolio, and Justice Minister Ayelet Shaked (Jewish Home) have scheduled a press conference for Monday morning at 10:30. They are expected to announce their plans to resign from the coalition. Even if the Jewish Home remains in the coalition, however, it is unclear if Netanyahu can maintain a functioning government. Both the Shas and Kulanu factions have indicated that they favor going to early elections. A meeting between Netanyahu and Finance Minister Moshe Kahlon (Kulanu) failed to reach an agreement Sunday evening.